^^ Sorry, I fear being ladylike is not in her power. She appears to like behaving like a tart - if she didn´t she would not keep doing it. I also feel that she was taken to task big time after Boobgate in France. Then there have been all the other full skirt mishaps, the one in London when she was at an engagement, dressed all in navy, was very revealing and we never saw the half of it. Having arrived in NZ and flashed her infected crotch to the world she learned nothing, because less than three weeks later we had buttgate. I rather suspect she had some serious talking to after each flashgate, and that had no impact at all,. IMO princess lessons would have been a waste of time and effort. She is not interested in anything other than what she wants to do As they say, you can´t make a silk purse out of a sow´s ear, and wasty is definitely a sow´s ear. Amazing that most of us can behave ladylike without lessons, why can´t she. She appears to like showing her lady bits to the world, and nothing, it appears, is going to stop her. Sorry, we have to agree to disagree on this one, she is no lady, doesn´t want to be, and lessons, IMO, would be a complete was of tine, she has proved that. I doubt even a good charm school could have made much of an improvement on Waity, she has no class or dignity, there is nothing regal about her. Now many are aware of it and what a disaster this whole marriage has been, the role is too big for her as was feared in her ' courting' days. Maybe the best solution would be to put her out to pasture with her kids for their very early years and require nothing from her with any charity work - but she should not be given any special privileges, monies or titles in return. She could be William's wife but have no real official duties or status apart from the titles she has. And the Midds should also be elbowed aside as part of that gig and the RF be given the most influence on the children's upbringing and training starting when they are school age. The kids belong to the RF and the country and it will never work bringing them up Middleton if the monarchy is to continue in my view. I'm sure that if Kate wanted to improve herself, if she wanted to know more about etiquette, protocol, world history, world politics, she could have asked for lessons and I honestly believe she'd have good teachers willing to teach her. I'm not saying she'd have the best teachers because I'm afraid that the best of the best have much more important things on their minds than to get lessons through that thick skull of hers. Anyway, like I say she could have all that had she wanted it and I don't believe that she did. I mean, her husband surely must know almost all that there is to know about protocol and etiquette, he must have been of help. I'm afraid that there would be nothing to be done on the looking ladylike/regal department, she just doesn't have a natural grace about her, people are either born with it or not in my opinion. I totally agree that the children should start to be taught and trained by the BRF as soon as possible, god knows what kind of future monarch and 2nd in line to the throne UK will have if this Middlesocialclimber's clan keep their craws on the poor little ones. Well, royal kids start school fairly young and then they go off to boarding school. Between the nannies they have now and the boarding schools in years to come, I don't think she will see much of her children. And then when they're teenagers and young adults they're probably going to spend most of their time with their friends. Wasty, the world's worst kept secret drag queen. 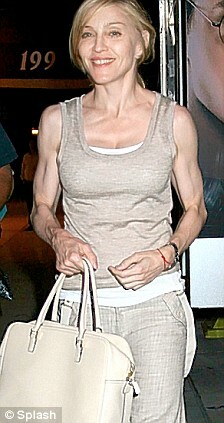 the problem with kate is she is too thin. her body lost all the softness and her face looks gaunt. besides her overexercised legs appear manly. she has legs like a soccer player. not a good look on a woman. The yo-yo dieting contributes to Waity's hard look. Many women buy men´s watches. I suspect the ballon bleu de Cartier she wears is a man´s watch too. Unless they are photoshopping it to make it look bigger. It is actually a very small watch, especially the women´s version. The watches appear to be available in 33cm, 36.6 cm and 42 cm. So wasty has the middle size. 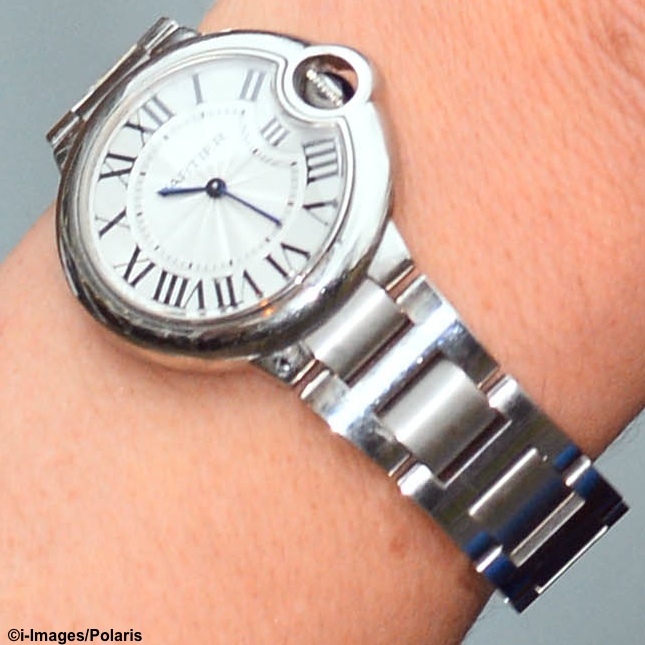 The particular Ballon Bleu de Cartier model Kate is wearing is a modest model in in the collection. It comes without any diamonds and the quartz movement is priced less than the automatic mechanical models. This is probably the correct decision as Kate tends not to be flashy in how she dresses. The retail price of the Cartier Ballon Bleu Medium watch in steel with a quartz movement that Kate Middleton is wearing is $5,650. The Ballon Bleu Medium is in this instance seen in steel and is sized at 36.6mm wide. It was definitedly not the small one. I didn´t know about a third size. Thank you for the info on the pricing. Not long ago you could get the quartz in stainless steel for lessm it may have been during a sale. But it´s kind of pointles since Carier employees were failing to recognize authentic watches from imitations and were reported to have undergone some re-training. They didn´t pay for it anyway, a freebie. Such a shame it is the people with all the money that get these "goody" bags when the go to events, so much money of their own. Look at randy andy, given a 12k Apple watch. Seems there are a lot of problems with them I read in the press, certainly do not seem to be worth the money at the moment unless they improve them. They have always used celebrities to promote new products and, apparently, it brings in money for companies. Why else do you suddenly see a bunch drving the same cheap car? Not sure it´s the same in the UK, but they do that here and in neighbouring countries. Lol I got such an ego boost yesterday: mother and teen daughter were discussing across a waiting room wether I was a model or not. Her mother pointed out I had a models body, they both agreed they didn´t know me but I definitedly looked like a model. I was pretending to read some papers and talking with a nurse, waiting for her to find something. The daughter concluded to end the discussion -probably because I took some glances at them- "She may look like a model, but still not be one". OMG. At least they didn´t try to force me admit I was a now former model from Europe, like some girl did in uni years ago. I said, well, they say we all have doubles and she replied, yeah, but they are like other ordinary people you see on the street. Yes, companies do the same in the UK as well, hence the goodie bags provided which included thousands of pounds worth of expensive items. That is said to be how wasty got her Cartie watch, and the timing was right. I think they play that game the world over. When you think of the good all that money could to to help many causes, and yet the already rich people are given it, and normally it means zilch to them. Still, in their eyes it is business and you get copy cats who want what celebs have - can´t cally the rf royalty any more, they all appear to be celebs these days. She can sport all the Cartier watches and jewelry in the world but this fact will always remain: She is still a Stalking, Lazy, Lying, Flashing, Slattern, Ignorant, Mean, Mindless, Uncreative Potato Head programmed by her Witch/Hag Council Estate mother. The Welsh are welcome to keep all the plastic English royals, & pay for them. Kate has an Adam's apple in these pics, you can keep him as well. Several of us have said that before now, that adam´s apple, very odd. I still think she has Androgen insensitivity syndrome - fits in with most of the shenanigans she causes, and that very masculine look she favours, the large steps when she walks, the man hands, the adam´s apple, that very masculine looking face of hers, she often looks like a man in drag IMO. Maybe that is what the attraction is for willy as rumour has it that he swings both ways. Waity as the second coming of Wallis. I think she lost too much weight. I don't remember her hands seeming so big, or her Adam's apple sticking out so much, etc. when she weighed more (before the engagement). Her body used to be a "banana" shape but now it looks to be "inverted triangle" which is a masculine shape (broad shoulders). I think she needs to gain back about 15 pounds, with exercise (otherwise the fat will go to the wrong places) and then she'll look good again. I'm increasingly convinced that Middleton is a man and that Willy is gay. They look so genuinely happy together, and that would be difficult to sustain if it were a complete hoax. Add to that the two surrogate pregnancies and you have a compelling case.